Seldom heard or taste Austrian wine? This will be the best event for you. 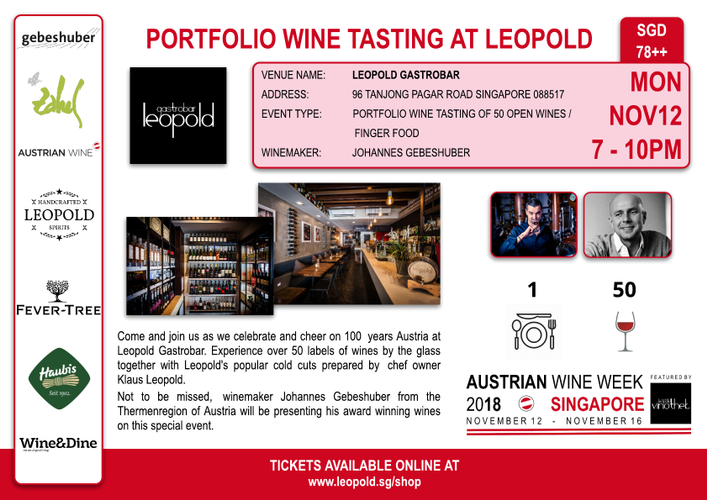 Located along the Tanjong Pagar conservation shop houses, Leopold Gastrobar which is also host own restaurant will be location for the opening event of the Austrian Wine Week 2018. Over 50 wines by the glass for guest to taste. Leopold famous cold cuts platters will be serve, a perfect match with wines and also a perfect day to cheer on 100 years since the declaration of Austria as a republic on 12th November 1918. Also, winemaker Johannes Gebeshuber will be present to share more about his wine and its specialty.